Bright Club is heading back to Green Man Festival this August 15th-18th, and we are taking some of the best Bright Club talent from the last year with us from London, Manchester and Guildford. If you are already going, or fancy joining us (tickets are still available for the festival), we’ll be in the Omni-Tent in Einstein’s Garden on the Friday and Sunday nights, 6pm-7pm. 24th International Congress of History of Science, Technology and Medicine in Manchester. 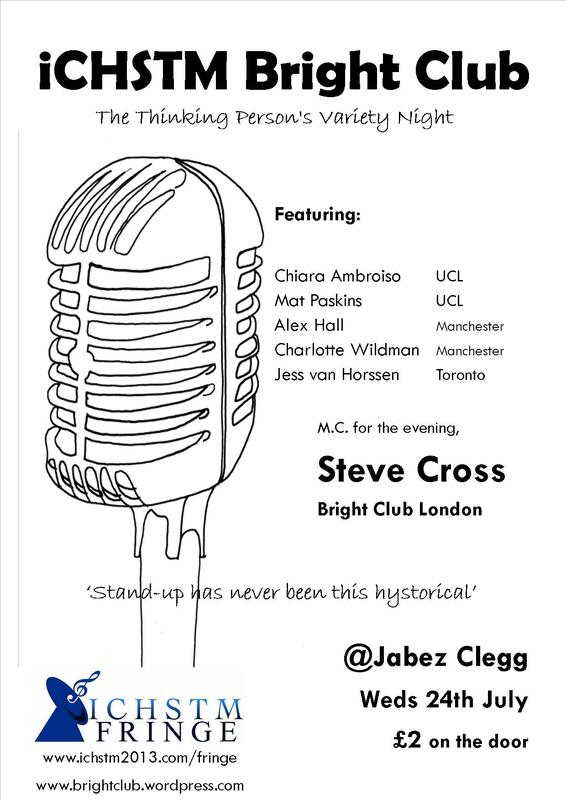 Come to the Jabez Clegg on the Manchester University campus for a night of the funny side of the history of science and medicine, MCed by the man who started Bright Club, Steve Cross from UCL. Doors will be open from 8.30 and the gig starts at 9pm! It’s £2 to get in.